Explore Malmö by water on an included canal cruise, complete with coffee and cake. Depart from a centrally located pickup point in Copenhagen and enjoy the spectacular ocean scenery as you cross the Øresund Bridge in a comfortable, air-conditioned vehicle. On arrival, greet your knowledgeable guide and listen to a brief introduction of the city before setting out to explore independently. Using the recommendations provided by your guide, absorb the convivial ambience of Lilla Torget and Stora Torget, two main squares replete with sophisticated boutiques and enticing cafes. Visit the Moderna Musset Malmö to pay homage to the city’s rich contemporary art scene and admire exhibits by Dali, Matisse and Picasso. Please note, entrance fees must be purchased at your own expense. Reconvene with your group at a pre-arranged time to enjoy a complimentary 1-hour canal cruise; see the beautiful city from an alternative perspective as you glide beneath bridges past Malmö’s charming Old Town. Gain insight into the city’s rich historical heritage before returning to your vehicle for the relaxing journey back to your original departure point in Denmark. Customers must bring a valid passport. For customers from within the EU, another form of valid ID will also be accepted. Sean was a great guide and our canal tour guide was fantastic. We learned so much about the area and everyone was very friendly. Impresive bridge, amazing city, professional guide (Fleming), lovely boat tour.. I would recommend this day trip. The guide did a terrific job!!!! We enjoyed seeing the city and loved the boat ride. Kelly W.
I was so excited to go on this tour along with 3 of my friends. Our Viator vouchers all showed 10:00am as the meeting time and we got there at 9:45am only to find out that the tour left at 9:30am. I asked if the time had recently been changed and the tour operator said no, it's always been that time so Viator definitely had the time wrong and we missed our trip. Went on this tour and it was punctual, we drove to a scenic outlook point which was stunning. It helped that it was a clear, blue sky day. Malmo was a quaint little city. When we arrived the driver told us where to meet him when we were done. I asked for a tourist map of the area, then only did the driver say oh thats a good idea and went off and got a map. By then most of our group had left so the poor souls were wondering around aimlessly. The driver was either not very knowledgeable or just lazy. He said he would give more info on the way back, but it was radio silence. The canal tour was beautiful. This was a lovely tour but it could have ben better. 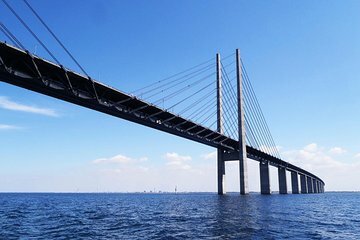 A good trip to experience the Oresund bridge and Malmö. The Canal tour was good. It was a Sunday so Malmö centre was a little quiet. It could be better if the driver from Copenhagen to Malmö gave more commentary. Most of the trip was in silence, he needed to try harder. While Malmo was a beautiful city in Sweden, we felt we should have used the day to explore more of Copenhagen. It might have been better as part of a tour of Sweden! Alex the driver was great. This was a low intensity and very pleasant trip.